We have posted about numerous folks who have traded stationary homes for RVs. People make this choice for a variety of reasons. They might want to see the world, live a more minimal existence, reduce overhead and so on. Despite these attributes, many bristle at the idea of a roving home that depends on a fossil fuel hungry internal combustion engine. 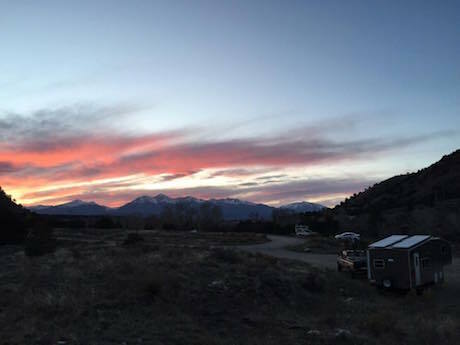 Recent fulltime RVers Ching and Jerud had similar reservations, but ultimately decided an RV was the best type of home to do what they wanted to do: live self-directed, outdoor-centered, low-overhead lives. Today’s guest post by Ching goes into some of their story: why they chose to live in an RV, the ups and downs of the experience and even how they made it work with their environmental sensibilities. Read more about their journey on Live Small Ride Free. My desire to downsize my life from a 1,200 sq. ft. house to a 200 sq. ft. RV was driven by my love for the great outdoors and need for exploration. Yearly two-week-long vacations always ended in a blink of an eye and I felt time was becoming more and more my enemy. I didn’t want to wake up one day to realize that I was too old, too comfortable and had too many strings attached to live the life I always wanted. And I was tired of reading about other people’s adventures while daydreaming about mine. It finally hit me that there wasn’t any reason I couldn’t live the way I wanted–traveling fulltime on the road. Living in an RV wasn’t initially our first choice because of its carbon footprint. Yes, it’s less than living in a standard house, but the irony of traveling to America’s beautiful natural landscapes while burning fossil fuel didn’t escape us. But we realized that an RV actually best fit our needs and that we could further decrease our carbon footprint with some modifications. RVs use a mix of electricity and propane to power everything inside them – from running the fridge, heater, stove, and lights, to charging cell phones and laptops. Electricity is generated either by plugging into the grid at an RV park, a diesel generator, or sometimes aftermarket solar panel additions – but propane does the majority of the work, heating the interior, the water, and cooking food. We decided to remove all of our propane appliances, go fossil fuel free and turn our RV into an all-electric rig powered totally by solar panels. On top of that we challenged ourselves even more by converting our truck – our tow vehicle – to run off of waste vegetable oil instead of diesel Sustainability was our other priority next to creating a new life of mobility and freedom. Our new lifestyle is simpler and happier than before, but it’s also challenging. We didn’t just change the size of our home but how our home functions, which meant there was a lot we had to learn. Also, in our new life we are more aware of how we are living and what we use – I call it conscious living. We know exactly where our electricity, water, and fuel comes from and how much is available to us. Our energy has been diverted to things that are important to us rather than what’s important to society or our employers. In a sense we’ve regained control of our lives and our future, and it feels good, scary and right. The highs that we’ve had so far during our 9 months on the road: the day we rolled out of our hometown; having our RV that we spent a year rebuilding not instantaneously fall apart as we drove away; waking up to our first snowstorm in Colorado and not running out of electricity on that cold cloudy day; driving from Missoula to Seattle on nothing but waste vegetable oil; pre-dawn hike to watch the sun rise above the Cascade Mountains; racing the sunset while mountain biking in Colorado; and kayaking snow-fed lakes. But as with all highs, there are lows to balance things out: having our truck’s brakes fail while driving up a mountain; spending three months looking for a replacement truck which halted our travels; dealing with major RV battery issues; being stuck in a truck with an old, incontinent dog with diarrhea; having my touring bike and dog trailer stolen; and the days when we just can’t find available waste vegetable oil. A big low is our current lack of financial security. We didn’t have career backgrounds that could easily transition to a mobile setting and we chose to leave before securing new jobs. Part of the reason we are able to do this is because the cost of living isn’t very high for us thanks to our RV and truck setup. There are a wide variety of job opportunities for full-time RVers and the RV community is a great resource. 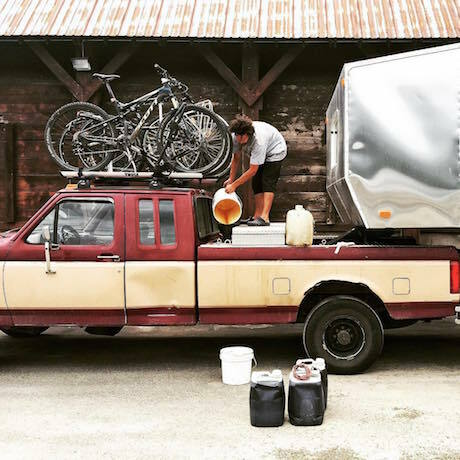 We’ve given ourselves a year to figure work out and have had income from a rental property to float us while we adjust to life on the road. Becoming a full-time RVer didn’t automatically make my life perfect and happy. But being proactive and changing my life to be structured the way I want and living my priorities has created a huge sense of calmness for me.